Indulge in tastes from 35 of Bayside’s best restaurants for under $1 per restaurant! 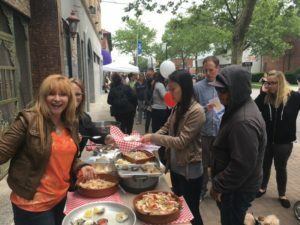 The second Bell Blvd Food and Music Fest restaurant stroll will take place on Bell Blvd between 38th and 43rd Aves as well as on 41st Ave. The diverse cuisine options include American, Italian, Chinese, Japanese, French, Spanish, Irish, Greek, Indian, Korean, Cajun, Vietnamese, Japanese and Tex Mex. New styles of food, as well as traditional favorites, are on offer. Some of the bars and pubs will feature signature cocktails and special beers. New restaurants like Spanglish and Mahjong Cafe will join fab favorites like Bourbon Street, Papazzio and Maria’s Mediterranean. Some of the participating restaurants include: Aperitif Bistro, Avli Cafe, Avli Little Greek Taverna, Bayside Dumpling, Bourbon Street, Fiamma 41, The Supper Room, Hatfields, Krave It, Kung Fu Tea, Local Bar and Grill, Masala Box, Monahan & Fitzgerald, Nippon Cha, OSP, Papazzio, Pizzeria Uno, Pour House, Press 195, Red Mango, Sangarita’s,Taverna Kyclades, Taco Han, Tanko, Thai 101, Uncle Jack’s Steakhouse, VIPizza, and New Golden Wine & Liquor and more! In addition to a vast array of dining options, the Bayside Village Food & Music Fest will feature live free music on every block as well as a salsa demonstration and dance lessons with a live band. Activities along the corridor will include retro games like skee ball, minigolf, shuffleboard and beach ball volleyball. A new 8’ wide spirograph built by the Bayside HS Key Club and NY MakerSpace will also make its debut at the event and be available for play. Advanced tickets are $30 for adults and $12 for children under 12 years old. Tickets can be purchased online here at bellblvdfoodmusicfest.eventbrite.com or in person at Avli Cafe, Papazzio, and Bell Bay Florist on Bell Blvd. Same day tickets will cost $40 for adults and $15 for children. To learn more about Bayside Village BID, visit www.baysidevillagebid. See you on May 19th!